By Golly, Molly! 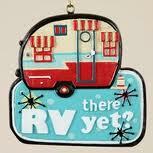 : RV Having Fun Yet? "RV there yet?" my kids wondered last weekend. We didn't even go very far - just two hours or so. Nothing like the massive trip my parents took clear up to New York last month. But 6,000+ miles later, their RV still had enough gumption to take our family of five on our first RV excursion. Actually, let me back up (which is hard to do when driving a 24-footer), I've been telling people it was my first time in an RV. However, I think I lied. Or forgot. Or just blocked it out of my mind all together. Because there was a time I lived in one for about four months at a KOA campground near Tyler, Texas. I was seven-years-old, and our family needed a temporary place to live while my mom and dad went to a Bible school. Come to think of it, you know when you check into a hotel, and sometimes you discover not everyone there is vacation-minded? That for some hotel guests, the place is their home? And suddenly kids ride up on bikes to watch you unload your car, and you say to them, "Oh hey, how's it going. Yup, just going to Sea World tomorrow with the fam." And it makes the whole "We're in a hotel on vacation!" excitement diminish because, well, the people in the room next to you aren't going to Sea World tomorrow? And then you feel bad? Well, it was kind of like that. Only we were the live-in "guests." And I was that kid. RV families would pull in and there I'd be, gap-toothed and wispy-haired. Riding up on my banana-seated bike with tasseled handlebars to watch vacationers hook-up their RV trailers. Make that standing up on my bike. I wanted everyone to see the big comb in my back pocket. Now ditch the bike, gaping teeth, big comb, and interest in trailer hook-ups (but keep the wispy hair), and fast-forward to last weekend. It might as well have been my first time RVing, for it was my first time taking charge of what we're all going to eat, where to stuff the dirty clothes, and who-gets-which-blanket. And my husband soon learned the benefits of joining Boy Scouts as a young lad. That's had he joined Boy Scouts, our campfire may not have exploded. Oh, thanks to Bear Grylls, he got the fire-likes-oxygen thing down well enough. But where he went wrong (or not wrong - still not sure what happened exactly) was when he placed the firewood on top of a rock and a brick, thinking it'll promote more oxygen and make the fire happy. But it made it too happy. So as little embers and sparks fell on my family, sending my son running straight into the night, it reminded my nine-year-old daughter of the end of the world. And through tears, she somehow connected explosion and "end of the world" with how we don't have a fire escape plan mapped-out for our real house. (Thank you, third grade, for teaching my daughter how out-of-your-mind scary it is to not have an upstairs window ladder.) So I told her, in the meantime, to just hang and drop. Ah, but was the whole trip a disaster? Not even! We giggled over a couple games of Balderdash and how our RV was on a constant tilt (though that one was a forced giggle). And we even walked around the site, secretly giving awards to the coziest and most festive Thanksgiving-themed RV set-ups. And it's true, Romans 12:18 is right-on by saying, "If it is possible, as far as it depends on you, live at peace with everyone." Because when you cram a cranky mom, a frazzled firewood-arranging dad, and three button-pushing kids into an RV for 48 hours, there just has to be a good God-given motto behind answering "Yes!" when asked, "RV having fun yet?"